Ant colonies should be selected to optimally allocate resources to individual reproductive offspring so as to balance production costs with offspring fitness gains. 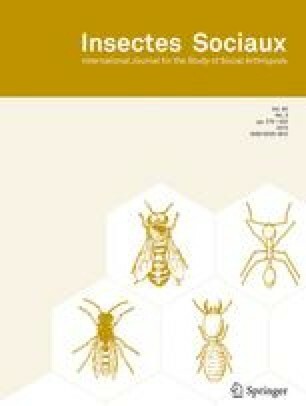 Different modes of colony founding have different size-dependent fitness functions, and should thus lead to different optimal queen sizes. We tested whether a behavioral transition from solitary colony founding (haplometrosis) to group colony founding (pleometrosis) across the range of the ant Messor pergandei was associated with a difference in queen size or condition. Both winged gynes and founding queens were significantly smaller and lighter at pleometrotic than at haplometrotic sites, with an abrupt shift in these characters across the 8.5 km-wide behavioral transition zone. Both the mutualistic advantages of grouping and among-queen competition within associations are likely to be important in selecting for smaller queen size in pleometrotic populations. Received 16 January 2004; revised 13 August 2004; accepted 16 August 2004.